If you're after a casual yet stylish look, try teaming a beige shearling coat with blue ripped jeans. Both garments are totally comfy and will look fabulous together. Up the cool of your getup by wearing Maison Margiela tabi ankle boots from farfetch.com. 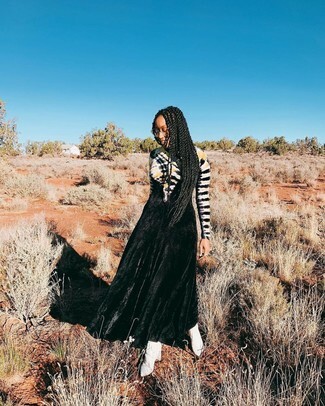 If you're on the lookout for a casual yet totally stylish outfit, go for a multi colored vertical striped long sleeve blouse and white culottes. Both garments are totally comfy and will look fabulous paired together. Bring instant interest and excitement to your look with Maison Margiela tabi ankle boots. For a nothing less than drool-worthy ensemble, wear a black tie-dye evening dress. 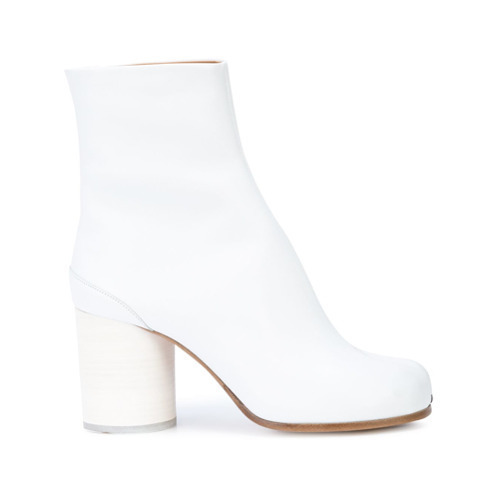 For the maximum chicness make white leather ankle boots your footwear choice. If you're after a casual yet totally chic ensemble, try pairing a black fur coat with black boyfriend jeans. Both pieces are totally comfy and will look fabulous together. Make Maison Margiela tabi ankle boots your footwear choice to take things up a notch. If you're hunting for a casual yet totally chic look, marry a grey trenchcoat with tan shorts. Both garments are totally comfy and will look fabulous paired together. Balance this look with Maison Margiela tabi ankle boots. We're all ensembleing for comfort when it comes to dressing up, and this combination of a pink knit oversized sweater and a pink corduroy mini skirt is a practical example of that. Up the cool of your look by wearing Maison Margiela tabi ankle boots from farfetch.com. If you're a fan of comfort dressing when it comes to fashion, you'll love this super cute pairing of a dark green quilted bomber jacket and white ripped skinny jeans. Take a classic approach with the footwear and go for a pair of white leather ankle boots. If you use a more relaxed approach to style, why not wear a beige crew-neck sweater and grey skinny jeans? Wearing a pair of Maison Margiela tabi ankle boots is a simple way to add some flair to your look.